Our Beanie Caps are made of 100% Acrylic and knitted in a close, fine gauge for extra warmth and a coomfortable fit. They are 12 inches long to insure they will give complete coverage to the wearer. The "Prevent Wildfires" and Smokey's image show you are a member of the Smokey's team. Order more than one to go with everything as they come in four different colors! 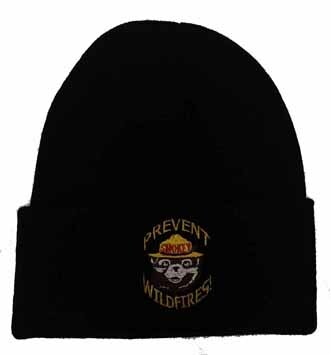 The forest Green, Navy and Black beanies are embroidered with gold collored "Prevent Wildfires" and the khaki beanie has black printing.